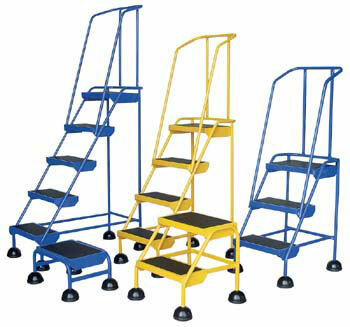 Commercial Spring Loaded Ladders - Commercial users of rolling ladders now have an attractive and economical alternative to the traditional warehouse rolling ladders. This sleek design also provides maximum safety and convenience. The all directional spring-loaded swivel casters feature steel dome protection and include rubber pad bottoms to minimize movement. Each step is covered with serrated rubber so users will not slip. The powder coat finish provides a durable attractive appearance. Capacity is 300 lbs. See chart below for specs. Available in Yellow, Blue, or White. 1 Rubber 9-3/4" 21-1/8" x 16-1/8" x9-3/4"
2 Rubber 18-3/4" 21-1/8" x 20-1/4" x 18-3/4"
3 Rubber 28-1/2" 21-1/8" x 26-7/8" x 60-5/8"
4 Rubber 38" 21-1/8" x 33-1/8" x 70-1/4"
5 Rubber 47-1/2" 21-1/8" x 39-3/8" x 79-3/4"